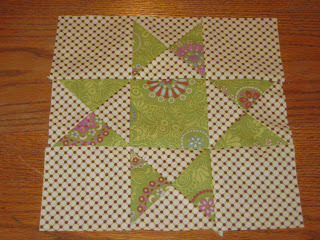 Here is the lovely Ohio Star square. And this is called the Swamp Angel. No, I don't know why it's called that, but I feel bad for this square to be so cute but to have such a unpleasant name. The concept for this week was to learn quarter-square triangles. I love learning these techniques because you don't waste any fabric when you make them...and who doesn't love that? I love both of these! I'm getting so excited to see the finished product. 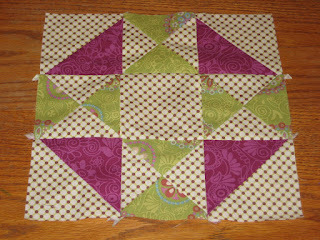 You are definitely inspiring me to ask for a sewing machine for Christmas and to learn how to quilt! Hi! My name is Brittney and I live in beautiful northern California. I have a wonderful husband and three energy-filled sons. I am so blessed to have them....but sometimes a girl has just got to get away and do, well, girly projects. Ding! My blog is born! A place to catalog my many projects, recipes, books, ideas....or whatever I feel like putting on this blog! Hope you enjoy and feel free to leave comments if you would like more information about anything posted.